In 1986 in Oklahoma City, the employees of a movie theater are murdered during a robbery. Wyatt, now a private investigator in Las Vegas, was the only survivor. When asked by a friend to travel to Oklahoma City and find out who’s been harassing the new owner of a local rock club, he finds himself revisiting the scene of the massacre, as well as unearthing long dormant memories. Another crime in 1986, although not connected, was the disappearance of Julianna’s older sister, Genevieve, at the Oklahoma State Fair. Julianna has been in an emotional fog since, desperate to know what happened to her sister. Both Wyatt and Julianna explore their pasts, finding new clues that will hopefully bring them both some closure. 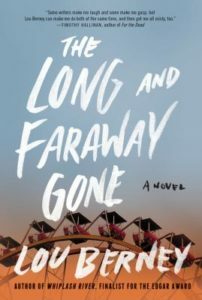 The Long and Faraway Gone is a character-centered novel reminiscent of Dennis Lehane. Lou Berney’s mystery won an Edgar award for Best Paperback Original, deservedly so.